On The Brewhouse wall I have written a list of answers to frequently asked questions; this is not because I am too grumpy to speak to people, but sometimes I am out. The technical questions are quite straightforward, the very frequent one that I am still struggling to answer is "What is an artist in residence ?" 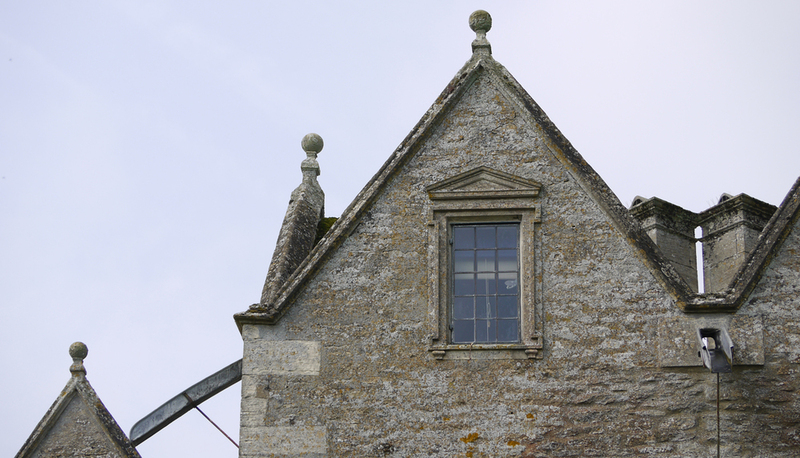 I can describe - in this blog - what I have been doing at Kelmscott Manor, and emphasise that I am not actually living here, but I don't think that's the right answer. I do have a quote from the will of May Morris, bequeathing the Manor to Oxford University in 1926 with certain conditions. "The condition of the bequest is that the house should be used by the university not to be let for profit, but as a rest-house for artists, men of letters, scholars and men of science, whether for shorter or longer periods". As you know, I am very anxious to please May, the quote is going on the wall and I'm hoping that will do the trick (despite the unfortunate "men of...." wording). One of the first things I liked in Jane Morris' bedroom was not this portrait of her, a CFM watercolour copy of a DGR original, but her daughter May's comment displayed alongside. "It bothered me to have house and church and boathouse all brought together when they were really in different directions..."
Aided by aerial photographs of Kelmscott Manor in the 1972, I have been turning my drawings into designs that are topographically correct, and include paths and rivers where I have seen them in relation to the Manor. Ink sketches above : design 1 (from the east), design 2 (from the south), design 3 (from the north east). Sketches for repeats based on designs 1, 2 & 3 below. I am particularly drawn to the case of May Morris' possessions in one of the attics. Box Cottage, above and below, is giving me lots of ideas for projects while I am at Kelmscott. Below : Part of May's frieze of Kelmscott and The Manor with WM's words (from The Earthly Paradise) embroidered in the 1890s and now in the William Morris Gallery, Walthamstow. "As a keen watercolorist, her intimate knowledge of nature came from personal observation, en plein air, an experience that her father found either uncomfortable or unnecessary." 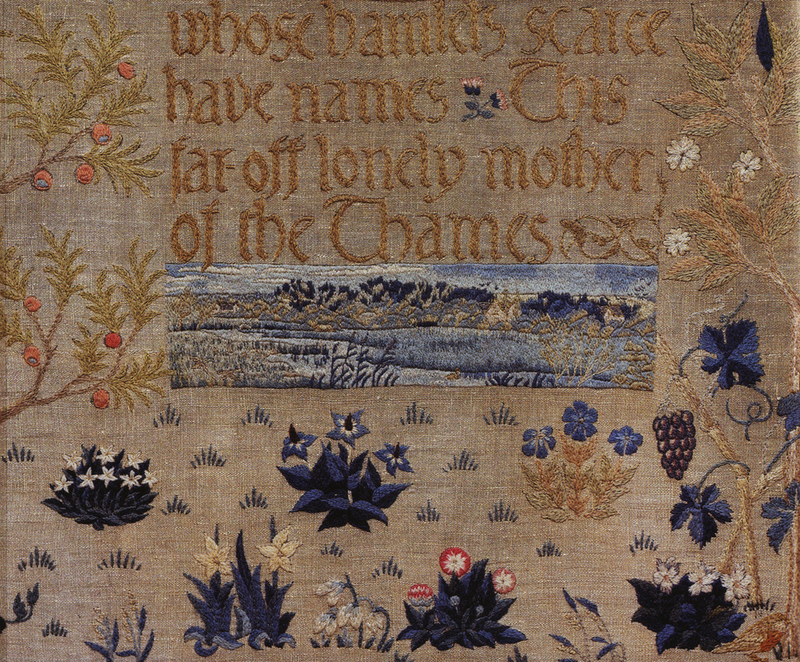 Linda Parry, May Morris, embroidery and Kelmscott. "You see William Morris could design embroideries but he could not embroider, any way not as well as Miss Morris could, Mrs. Morris could embroider but couldn't design, Miss Morris could and did both design as well as William Morris and embroider as well as any one possibly could..." Mary Lobb, from a letter to Eric Maclagen.